Tiny is a big dog. When he gets dirty and needs a bath, his human tries everything before putting him in the pool as it's the only thing big enough for Tiny.It's very simple reading, good for kids just learning to read. Repetition of words and phrases. Could "think aloud" the characters' thoughts. Good title for first grade book clubs. This looked like a cute book about giving a dog a bath and it is. Sadly, though, our girls are getting a bit too old for these easy reader books, so occasionally I get the eye when I bring one home from the library. Still, they were fairly game for this book and we even took turns reading aloud. It's a short story, with humorous illustrations and some repetition to help beginning readers. We enjoyed reading this book together, but I suspect that we won't be reading books like this for much longer. 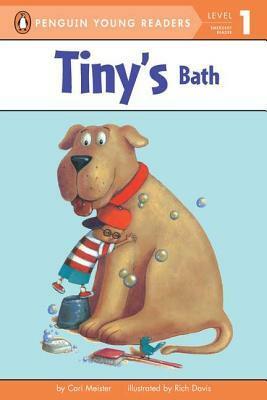 Even the littlest of readers will laugh out loud at the mischievous antics Tiny creates trying to avoid his small owner's determined to give him a bath! Lots of large illustrations and repetitive text will help even the youngest readers with the story. This was one of my first acquisitions--​it's the easiest easy-to-read we had ever published at the time. Cari Meister Rich Davis - Cari Meister lives on a small farm in Minnesota with her husband, four sons, three horses, one dog and one cat. Cari enjoys running, snowshoeing, horseback riding, and yoga. She loves to visit libraries and schools!